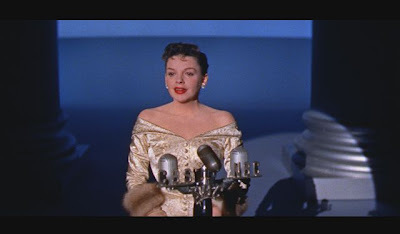 Long known in Hollywood as a woman's director given his sensational work on pictures ranging from The Women to Little Women and even being the first filmmaker assigned to Gone With the Wind, it seems only fitting that Judy Garland's husband Sid Luft would seek out George Cukor to helm the picture that would be her comeback film, A Star is Born. 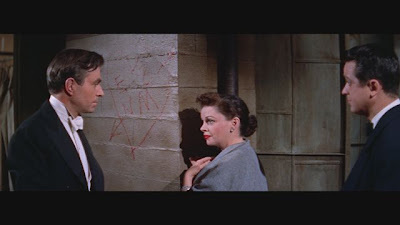 The work was a remake of the 1937 eponymous original that ironically Garland had already tackled in 1942 opposite Fredric March in a radio adaptation. 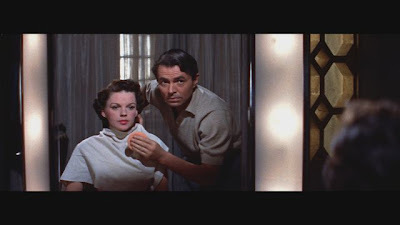 Nonetheless it took twelve more years and the cancellation of Garland's contract by MGM due to the star's increasingly erratic behavior to bring about one of the most moving yet incendiary indictments of what the studio system can do to its talent made inside the studio system in this Warner Brothers masterpiece. 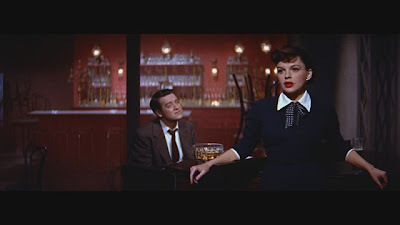 Star marked Cukor's first technicolor feature in a production that was eventually lensed in CinemaScope thereby necessitating that footage would have to be scrapped and reshot to fit the Hollywood process devised to lure audiences outside their homes and away from their television sets. Additionally, the work which was adapted from the '37 script by acclaimed scribe Moss Hart was also the filmmaker's first musical, made a decade before he released the Best Picture winner My Fair Lady again for WB. 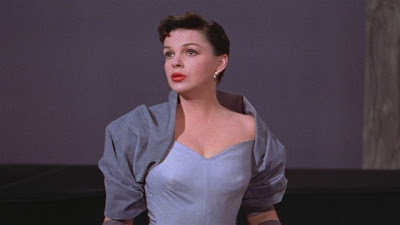 Arguably Judy Garland's greatest screen performance in a film so complex, tragic, romantic, cynical yet dream-filled that it could practically be considered the closest thing to American musical's first near-operatic endeavor prior to West Side Story, A Star is Born chronicles the parallel rise of one woman's career while her mentor and eventual husband's own livelihood starts a rapid decline in this poignant celebration and indictment of the dream factory. With its multi-layered narrative that illustrates the “birth” and “death” of a star, Cukor's hard-edged musical manages to give us more breathing room than Billy Wilder did with his own Hollywood fatalist dramedy Sunset Boulevard, even if it's Boulevard that we'll most likely turn to for repeat viewings due to his amazingly astute noir tinged script that's influenced everything from The Player to American Beauty. 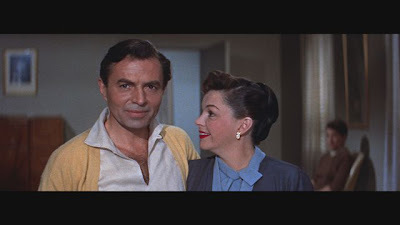 Easily the strongest interpretation of the thrice filmed storyline, Cukor's A Star is Born finds fresh faced Esther Blodgett (Garland) given a shot at the big time after she steps in and rescues a big star (James Mason's Norman Maine) from drunken embarrassment at a charity show. Grateful for the fact that her quick thinking and inventive humor found the audience applauding Maine rather than booing him, Norman sets off on an all night pursuit to thank Esther personally only to be blown away by the force of her sensational voice and the way she sings “The Man That Got Away” as if he'd just walked away with her heart seconds before the song began. Helping to set her on the path for stardom, Esther-- whose name is quickly changed to Vicki Lester by the studio – reveals that her own gratitude has evolved into romantic love, eventually marrying Norman before tough times hit their relationship as Esther's career skyrockets just as his goes screeching to a halt when he's “retired” by the studio. As Norman struggles with sobriety and sanitarium stays, Esther tries to continue to remain supportive, willing to give up the career Norman built so that she can be with the man she loves until tragedy strikes in a tearjerker third act. Unfortunately the film was released during the same calendar year as The Country Girl which found Grace Kelly playing a similar frustrated wife of an alcoholic in a performance that inexplicably beat out Garland's for the Oscar, perhaps indicating that the award had more to do with politics and burned bridges for the “Norman Maine” like Garland. A Star is Born nonetheless remains the finest cinematic achievement by the actress whose energy floors you as she acts out a major musical number for her husband at home and likewise hits all of her dramatic non-singing notes as well. After being drastically cut by the studio to squeeze in additional screenings of the originally three hour work following its successful 1954 premiere, the fully restored and preserved film was salvaged in 1983 by historians. Included officially as a National Treasure in 2000 at the Library of Congress, Cukor's classic makes its way to WB Blu-ray and DVD in this Deluxe Edition that tries to faithfully piece together the work the way it was intended to be shown. And while brief flashes of moving images and single stills make up some of the lost footage – most noticeable during a roughly ten minute previously exorcised sequence that occurs forty minutes into the running time – the movie still looks and sounds absolutely incredible in this two disc set. Despite this, I couldn't help but wonder if only the second special features disc was added since the look of the DVDs isn't consistent throughout and oddly the movie has been presented on an old fashioned flipper disc necessitating you to switch sides midway through. Yet regardless of its superficial presentation, the bottom line is that for content sake, we're just grateful that unlike Garland's “man,” this film hasn't gone away since it appears in as closely as it can to its original masterful, show-stopping glory that still feels as timely in subject matter as it did fifty-six years ago when viewers may have been unable to separate Garland the individual with the tragic tale of a star on a downward spiral.